APPLICATIONS: Fit for 18" diameter an existing turbine base or vent pipe. Net free vent area 254 sq.in. 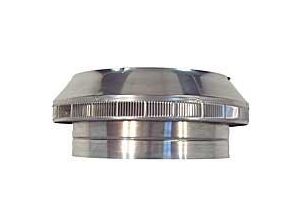 Available in 4” to 30” inside diameters (effective net free areas of 12.5 to 1,808 square inches). Aura 18 inch I.d. Vent Base. 24 x 24 inch Square Base Flange With 6 inch High Round Collar. Fits all 18 inch ID Vents. All Aluminum. Mill Finish. Price/Each.